6:00 p.m. = soup and bread dinner in the Life Together Hall. 7:00 p.m. = Lenten midweek worship in the Sanctuary. During the season of our Lenten midweeks, together we will focus on the sixth chapter of Luke, often described as the “Sermon on the Plain.” Luke, while paralleling Matthew’s “Sermon on the Mount,” is different and distinct from the latter. In Luke each week, we will hear of blessings and woes (Luke 6:20-26) and we will conclude the midweeks on March 21 with a final blessing of sorts from the Lucan text, where Jesus mandates love of enemies and a blessing of those who curse you, a prayer for those who abuse you. I choose to focus on Luke 6 during our Lenten midweeks, in part, because of the current state of the world and the peculiar calling of disciples of Christ in it. These rather poignant and challenging words of Jesus, as recorded in Luke, serve as a prophetic voice to each of us as God’s beloved. I invite you to join us for worship on the Lenten journey as together we remind one another of a call to manifest God’s love in Christ in the world. 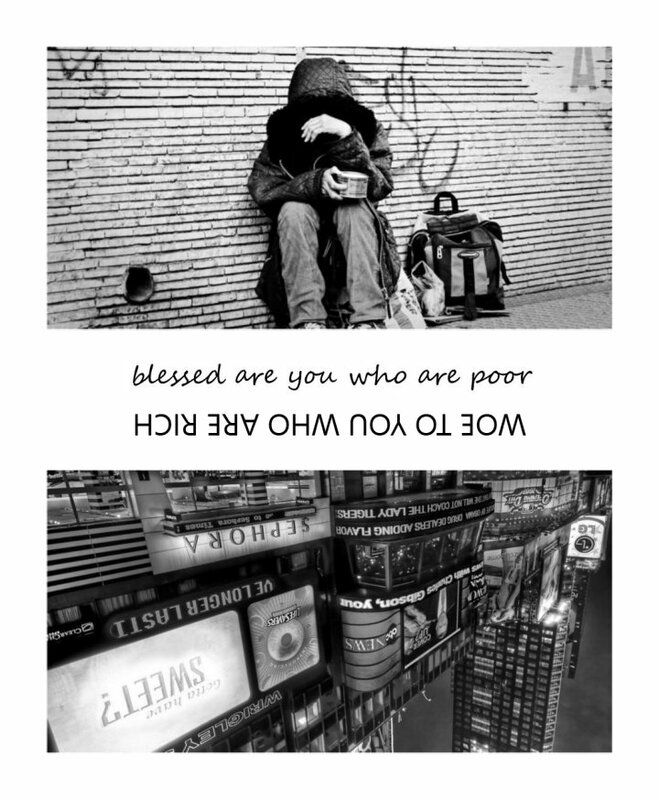 Blessed are you who are poor; woe to you who are rich. Blessed are you who are hungry now; woe to you who are full now. Blessed are you who weep now; woe to you who are laughing now. Blessed are you when people hate you; woe to you when all speak well of you. Top image: Detail of “Homeless,” photograph, 2009, by Sergio, www.flickr.com/photos/cosmopolita1/3981945075 [CC BY-SA 2.0 (creativecommons.org/licenses/by-sa/2.0)]. Bottom image: Upside-down detail of “From New York to Tokyo,” photograph, 2007, by Trey Ratcliff, https://www.flickr.com/photos/stuckincustoms/3946279121 [CC BY-SA 2.0 (creativecommons.org/licenses/by-sa/2.0)].